Greetings all, and Happy New Year! 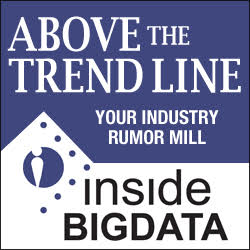 2019 is starting off with a big data bang with so much happening in our industry. We look forward to bringing you all the latest breaking news … starting today with some new funding new … Rubrik, the Cloud Data Management Company, announced a $261 million Series E investment at a $3.3 billion valuation with new investor Bain Capital Ventures, and with strong participation from existing investors Lightspeed Venture Partners, Greylock Partners, Khosla Ventures, and IVP. This brings total equity raised to more than $553 million. Rubrik will use the new funding for general corporate purposes, continued future innovation, and to support the launch of major new products planned for 2019. These new products will further capitalize on the sweeping enterprise transition to public cloud and the explosion of data. IDC estimates the overall data management market spend at $48 billion. Rubrik will also expand investment in go-to-market activities with the Company’s partners including Microsoft, Cisco, AWS, SAP, Nutanix, Oracle, VMware, Google Cloud, Pure Storage, and others … Seldon, the machine learning deployment specialist, announced a £2.7m funding round led by Amadeus Capital Partners alongside Global Brain Corporation, Techstars and other existing investors. Seldon is a pioneering global technology business focused on the fast-growing machine intelligence market. Its open-source machine learning deployment platform makes it easier and quicker to manage, serve and optimise machine learning models at scale. The platform is built on cloud-native technologies such as Kubernetes … Alation Inc., the data catalog company, announced it has closed a $50 million Series C funding round led by Sapphire Ventures, with participation from new investor Salesforce Ventures and existing investors Costanoa Venture Capital, Data Collective Venture Capital, Harmony Partners, and Icon Ventures. The Series C funding round will be used to further Alation’s leadership in the Machine Learning Data Catalog market and accelerate engineering investment in the award-winning Alation Data Catalog. In the last year, Alation has seen triple-digit revenue growth and exceeded 100 production implementations, including new customers Daimler, Fox Networks, and Hilton Hotels. At the same time, existing Alation customers, like eBay, Munich Re, and Pfizer, are expanding their usage of Alation from hundreds of daily users to thousands – leading to a net expansion rate for Alation of 47 percent … Alluxio, developer of the software system that unifies data at memory speed, announced that it has closed $8.5 million in Series B funding led by Seven Seas Partners with participation from existing investor Andreessen Horowitz, bringing the total funding raised to date to $16 million … Funds advised by Apax Partners (the “Apax Funds”) have announced a definitive agreement to invest USD 200m for a significant minority stake in Fractal Analytics, a global provider of AI to Fortune 500 clients. The transaction, which consists of a secondary stake acquired from existing shareholders and a primary investment into the business, is expected to close by February 2019. Founded in 2000 with the vision of powering every human decision in the enterprise, Fractal Analytics is a strategic analytics & AI partner to the most admired Fortune 500 companies globally. The company will use the investment by the Apax Funds to accelerate growth, both organically and through M&A, and to invest further in AI products and research … The University of Virginia announced plans to establish a School of Data Science, an effort made possible in part by the largest private gift in the institution’s 200-year history. UVA announced its plan for the school and the supporting gift of $120 million. The School of Data Science – UVA’s 12th school and the first established since 2007 – will position the University as a global leader in efforts to improve society through teaching and research based on the powerful, emerging field of data science. The grant to support the establishment of the University of Virginia School of Data Science is provided by the Quantitative Foundation, a private foundation based in Charlottesville. Jaffray Woodriff, a 1991 graduate of the McIntire School of Commerce, is trustee of the foundation. His wife, Merrill Woodriff, who completed a bachelor’s degree from the College of Arts & Sciences and a master’s degree from the Curry School of Education in 1998, is a foundation director. Jaffray Woodriff is also co-founder and CEO of Quantitative Investment Management, a private investment firm also based in Charlottesville. In the M&A category we learned … Lionbridge, the communications platform, announced its acquisition of Gengo, a Tokyo-based, leading edge technology company providing crowdsourcing, machine learning and localization services to global customers. Lionbridge has a 20-year history of leveraging its 500,000 linguistic experts to help the world’s largest companies expand their businesses on the global stage by providing machine learning data to make their platforms and products smarter and create content for a variety of industries. The acquisition of Gengo will strengthen Lionbridge’s position in the machine learning and content relevance markets. This purchase includes Gengo.ai, the company’s platform that provides AI training-data services delivered by a fast and efficient crowdsourced network of highly specialized contributors. We also heard of a number of new partnerships, alignments and collaborations … DataStax, a leading provider of the always-on, active everywhere distributed hybrid cloud database built on Apache Cassandra™, announced an original equipment manufacturer (OEM) agreement with Hitachi, Ltd. in Japan. The partnership expands DataStax Enterprise (DSE) to Japan via Hitachi’s digital twin solution for optimizing manufacturing processes with Internet of Things (IoT) data. Hitachi’s digital twin solution, part of Hitachi’s Lumada Solution, is tailored for IoT digital transformation in the manufacturing industry. The solution leverages DSE and DSE Graph to integrate the various data silos in manufacturing and operational processes. The solution also leverages DSE to establish a digital replica of data relationships in the manufacturing process for factories and warehouses with IoT data. Hitachi has also built a proprietary data model to visualize and streamline production operations based on DSE Graph. The collaborative technologies will enable various solutions for manufacturers, including product sequence optimization, supply chain optimization, product traceability, and product plan optimization … StreamSets®, provider of the DataOps platform for modern data integration, announced a technology partnership agreement with Snowflake, the data warehouse built for the cloud. In conjunction with the partnership, StreamSets also unveiled StreamSets for Snowflake. Now, StreamSets customers can easily create at-scale data pipelines for batch and streaming data from edge, on-premises and cloud systems directly into Snowflake, while automatically mitigating impact of data drift and ensuring data availability, quality and protection through continuous monitoring and Data SLAs. Snowflake’s enterprise data warehouse is designed to easily amass their data, enabling rapid analytics that quickly make data insights available to all users, consumers and systems that need them. Snowflake customers enjoy benefits such as instant elasticity, secure data sharing and per-second pricing across multiple clouds for data analytics … Igneous, Inc. announced that PAIGE, a new company focused on revolutionizing clinical diagnosis and treatment in pathology and oncology through the use of artificial intelligence (AI), has selected the Igneous Unstructured Data Management as-a-Service solution to protect and manage the enormous datasets of anonymized tissue images which are at the heart of PAIGE’s mission to develop AI algorithms for diagnosing and treating various forms of cancer. Through its partnership with Igneous, PAIGE will be able to securely and efficiently manage 8 petabytes (PB) of unstructured data, including anonymized tumor scan images and clinical notes, as part of an integrated machine learning-based healthcare AI workflow anchored by an industry-leading Pure Storage FlashBlade and NVIDIA GPU compute cluster … Alfresco, a leading enterprise open source provider of process automation, content management and information governance software, and Tech Mahindra, a digital transformation, consulting and re-engineering specialist, announced the extension of their global partnership and the development of new solution frameworks built on the Alfresco Digital Business Platform to meet the needs of today’s digital customer by simplifying content creation, access, sharing and review … Hiroshi Otsuka, Japanese industry leader and head of Musashi Seimitsu corporation, partly owned by Honda Motor Co, and Ran Poliakine, Israeli technology pioneer and founder of Poliakine Innovation, are partnering to develop artificial intelligence applications that will enable the future of Industry 4.0. The international partnership will be signed during the Economy summit held today in Jerusalem with the presence of Japan and Israel Governmental ministers of Economy. Japan-based Musashi and Israeli-based Innovation Center have declared a partnership to develop AI applications that will enable the future of Industry 4.0. Musashi organization, a global leader in ​powertrain parts manufacturing with more than 30 global manufacturing plants including differential assemblies, transmission gears, camshafts as well as ​Linkage and suspension​ parts, has joined forces with Ran Poliakine, head of the Jerusalem-based Innovation Center that brings together great technological minds in the area of Artificial Intelligence, SW engineering, HW engineering, mathematics and physics … Bsquare Corporation (NASDAQ: BSQR), a provider of Industrial Internet of Things (IIoT) services and software, announced it is collaborating with Amazon Web Services, Inc. (AWS) to meet the increasing demand for IIoT solutions. Bsquare has selected AWS as its preferred cloud services provider and is leveraging AWS to expand new offerings around DataV, a suite of edge-to-cloud IoT services and software designed to improve up-time, manageability, and performance of enterprise assets. In people movement news, we heard … Information Builders, a leader in business intelligence (BI), analytics, and data management solutions, announced the appointment of Frank J. Vella as chief executive officer (CEO). Reporting to the board of directors, he assumes responsibility for the management and operations of all aspects of the company. An accomplished global technology leader, Vella will drive growth, build on an established customer-focused culture, and lead the company to capitalize on emerging market opportunities. This marks an important milestone in the history of Information Builders, a New York-based pioneer in business intelligence software, as Vella succeeds the company’s founder and CEO Gerald. D. Cohen. Cohen will remain as chairman of the board and senior advisor to Vella … Teradata (NYSE: TDC), the pervasive data intelligence company, announced that its Board of Directors has appointed Oliver Ratzesberger President and Chief Executive Officer (CEO), effective immediately. Ratzesberger succeeds Victor L. Lund, who is transitioning from his role as President and CEO to Executive Chairman of the Board of Directors. Ratzesberger has served as Teradata’s Chief Operating Officer (COO) since February 2018, responsible for the Company’s global operations and leading its strategies for go-to-market, products and services. He joined Teradata in 2013 and, from 2016 to 2018, served as the Company’s Executive Vice President and Chief Product Officer, leading Teradata’s research and development organization, following a distinguished career in advancing innovation in technology at both established and start-up companies … Altinity, a leading service provider for ClickHouse open source data warehouse system, is delighted to announce that after a long search, the Board of Directors has appointed Robert Hodges as Chief Executive Officer (CEO) effective 1 January 2019. The previous CEO Mindaugas Zukas will take over as Altinity’s Chief Operating Officer (COO). Robert Hodges is based in the San Francisco Bay Area and has extensive experience with database systems and enterprise software. His background includes a stint at Sybase in the 1990s, development of SaaS products using Oracle and SQL Server, and over 10 years working on replication and clustering at Continuent, Inc. Robert became CEO of Continuent and led the successful sale of the company to VMware in 2014. At VMware he worked on hybrid cloud products, disaster recovery, and open source tools before joining Altinity in 2019 … Agorai, a global platform which provides the turnkey software solutions, technology and data needed for any company to join the AI economy, announced the appointment of Dr. Catherine Havasi as its first AI Science Lead. Dr. Havasi is recognized throughout the AI industry as a pioneer and leading expert around the fields of natural language processing and machine learning. For over a decade, Dr. Havasi has spearheaded projects and research initiatives at the MIT Media Lab that have been seminal in the development of AI for real-life applications. Additionally, Dr. Havasi has co-founded and led multiple AI-focused entities, including the ConceptNet semantic network and Luminoso Technologies, where she served as CEO for seven years. At Agorai, Dr. Havasi will play a vital role in the strategic assessment, development and integration of applications for its marketplace, set to go live in early 2019. She will also support technical due diligence on potential future acquisitions, as well as provide guidance around areas of revenue and technological growth. In the new customer wins department we have … Snowflake Computing, the data warehouse built for the cloud, announced the signing of a software licensing program (SLP) contract with the state of California. Snowflake is now listed as an approved vendor on the Department of General Services (DGS) website, where state and local public sector entities can procure Snowflake products and services. Government agencies will now be able to use Snowflake’s cloud-built data warehouse to get insight from all their data by all their users. In addition, they’ll be able to easily and securely share data in real time across all their business units, with other state agencies and with citizens. This is all made possible thanks to Snowflake’s key product benefits: secure data sharing, instant elasticity and per-second pricing across multiple clouds. With Snowflake, agencies can easily derive deep insights from data without the hassle and costs associated with existing legacy solutions … Vizru Inc., providers of a no-code, autonomous application development and digital transformation platform, announced that ZF Group, a global leader in driveline, chassis as well as active and passive safety technology, has signed a multi-year contract to enable a digital transformation across ZF’s global enterprise. ZF will use Vizru’s no-code Autonomous Application Development and Digital Decisioning Platform to implement a series of artificial intelligence (AI) driven systems for next-gen process automation. ZF selected Vizru for this ambitious multi-year initiative to help them drastically cut operational costs through AI-bot- driven automation and transform its customer experience without ripping and replacing any existing systems. Vizru’s no-code application development platform will enable ZF to assemble AI-bots over existing systems. Each bot is a self-sufficient environment consisting of an omni-channel communication layer, AI Workflows and a Data Access Hub which delivers end-to-end process automation, compliance, and an immersive customer experience. Vizru bots can seamlessly communicate over multiple channels including chat, web, SMS, email, etc., which was one of the essential criteria for the project. And finally, Waterline Data, a leader in data cataloging solutions and applications, announced it has been granted a patent for key aspects of its unique Fingerprinting™ and automated tagging technology, which provides for faster and easier discovery of the vast amounts of data stored in data warehouses, cloud services and databases across the enterprise. Waterline Data Fingerprinting combines big data analysis, machine learning and human curation to automatically catalog data and data lineage at scale, reducing the manual tagging of data by over 80%, increasing the overall data inventory and lineage accuracy 10x, and reducing the people cost for manual tagging and inventorying of data by 90%. Among the chief challenges in implementing a data catalog is populating it with useful information. Many organizations have a business glossary with defined terms and definitions but find that connecting this business metadata with technical metadata (which contains statistical demographics and the actual location where the data lives) is a costly, labor-intensive and highly error prone process. While some catalogs attempt to accomplish this through crowdsourcing, the approach doesn’t scale to accommodate the high volume of data that’s rapidly pouring into today’s petabyte organizations.